Beer in the United States is manufactured by more than 1,700 breweries, which range in size from industry giants to brew pubs and microbreweries. The United States produced 196 million barrels of beer in 2009, and consumes roughly 20 US gallons (76 L) of beer per capita annually. In 2008, the United States was ranked 16th in the world in per capita consumption, while total consumption was second only to China. While beer was an early part of colonial life in the United States, Prohibition in the early 20th century caused nearly all American breweries to close. After it was repealed, the industry was dominated by a consolidated number of large-scale breweries. The big breweries that returned to producing beer after Prohibition still retain volume sales in the 21st century. However, the majority of the new breweries in the US are small breweries and brewpubs, who as members of the Brewers Association are termed "craft breweries" to differentiate them from the larger and older breweries. The most common style of beer produced by the big breweries is American lager, a form of pale lager; while the small breweries, influenced by Michael Jackson, Charlie Papazian, and Fred Eckhardt, produce a range of styles. Beer styles originating in the United States include American Pale Ale, steam beer and cream ale. Native American tribes brewed beer in the lands of the United States prior to European arrival. One recipe was composed of maize, birch sap and water. The earliest record of brewing by non-Native peoples dates from 1587, and the first commercial brewery opened in the United States was at the Dutch West India Company of Lower Manhattan in 1632. The brewing traditions of England and the Netherlands (as brought to New York) ensured that colonial drinking would be dominated by beer rather than wine. Until the middle of the 19th century, British-style ales dominated American brewing. This changed when the lager styles, brought by German immigrants, turned out to be more profitable for large-scale manufacturing and shipping. [ Lager was also preferred due to its longevity, while local ales of the time quickly turned sour and were a perceived risk to drink. The lager brewed by these companies was originally based on several different styles of central Europe, but the Pilsener style, using mild Czech hops, pale, lightly roasted 6-row barley and often adjuncts such as rice and corn, gradually won out. Steam beer, the first style of beer to originate in the United States, evolved in the San Francisco area during the 19th century. After Prohibition ended, the Anchor Brewing Company was the sole producer of steam beer. The company was near closure in 1965, whereupon Fritz Maytag, great-grandson of the Maytag Corporation founder, rescued the brewery and with it the steam beer style. Anchor has since trademarked the term "Steam Beer" and all subsequent renditions of the style are now termed California Common. D.G. Yuengling & Son, commonly called Yuengling (pronounced "ying-ling"), is the oldest operating brewing company in the United States, having been established in 1829, and is one of the largest breweries by volume in the country. It is currently the second-largest American-owned brewery after the Boston Beer Company. Its headquarters is in Pottsville, Pennsylvania. 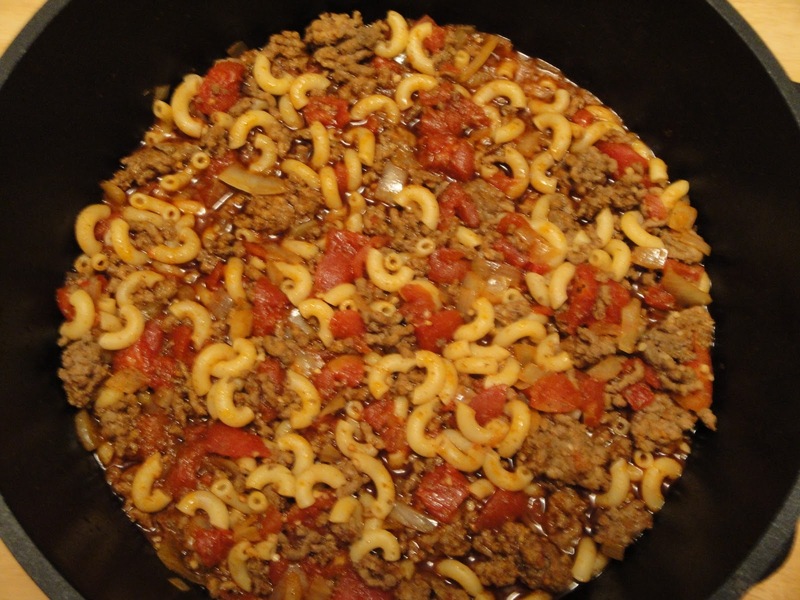 In a large pot, over medium heat, cook ground beef, until no longer pink. Season ground beef with salt and pepper. Stirring occasionally. Add onions, cook about 3 minutes, stirring occasionally. Add beer, garlic, chili powder, cumin, chipotle pepper sauce, salt, pepper, and diced tomatoes. Stir well. Reduce heat, simmer for 30 minutes. Cook pasta according to package directions. Drain well. Toss cooked pasta with meat mixture. Serve. Enjoy! Mmm, love the addition of cumin. And anything that involves a bottle of beer, well, I'm in! That looks meaty and delicious! Nothing like comfort food in the winter. Great recipe Christine. Christine, I think your receipes are so great for working women and moms that are so busy.Now that I am by myself I find that they are great for me also. Thank you for sharing all of these good and easy meals. I don't drink beer but every time I use it in recipes I am very happy with the results. Your recipes are so down to earth and yummy. Just like my family cooks! I love it! 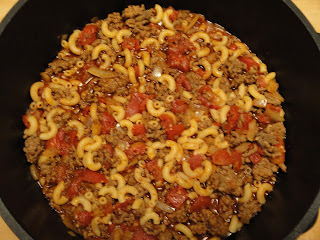 This chili mac sounds delicious! Wow, I didn't know the whole story about beer--your posts always have such great information. This looks hearty! This looks excellent, Christine! My grandmother used to make something very similar and it was always one of my favorite dinners!